Billy: When I came back to New Orleans after the storm I knew salons would be reopening and building their teams. I set forth to create a hub to train and prepare stylists to be on the floor in a few months. That training “school” concept didn’t quite work out so we opened up a teaching salon called Urban Angels in 2006. We had a lot of fun with it! After about 8 years, I wanted to further my education so I shut down Urban Angels and moved to California for two years. When I came back to town (basically I missed New Orleans) I wanted to do something more geared toward the client. 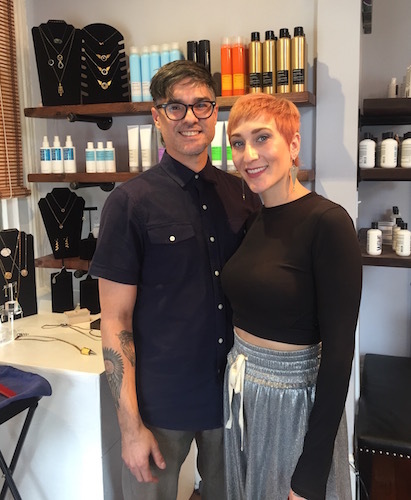 How this salon really came together is a “great experience of accident.” I ran in to Rachel, who I had known since she first moved to New Orleans 7 years ago, and we started looking for a small space for just two people. Rachel: It was a miracle we found this place! When we found it, we knew it was the perfect fit. Billy and I went old school New Orleans with the decor to give the space that “housey” feeling. Billy: We went for weeks and had pages and pages of ideas! What we were looking for was something that has a foreign appeal like from London, Paris or Barcelona. The salon names abroad are modern and relevant to the purpose of their existence. The name relates to what we do. Yes, we ask you what you like but what it comes down to it, I have the training to know what is going to work on your bone structure, on your face, and look best. We recreate people and bring out their inner personality and beauty. To me hair is the greatest accessory. You wear it everyday; it should be transitional, flourish, and have multiple movements to create new looks. Rachel: I have had a loyal clientele for 7 years that ranges from doctors and lawyers to students and artists– it’s all over the board! Billy: What draws people to us, I think, is personality and image. People from all genres and psychographs are drawn to Rachel because she is personable and genuine. At some hair companies you have to act a certain way and wear all black but here it’s real, it’s down to earth. We aren’t afraid to be honest and people respect our opinion because of that. I think for one New Orleans businesses run very successful operations without the business controlling them. Also, I’ve worked all over and do feel the relationship built between a business and their customers is much more personal here. I would say whiskey ginger. It’s strong, it’s got a little spice. It also helps you have a good time while settling your stomach– a mix of fun and practical. In this business success is consistency, honesty, and challenging yourself to be better everyday. Also be aware what people are wearing, how people are acting, what the mood is, and what new trends are coming to New Orleans. I feel like if you can pay attention and zone into these things you can create a very successful life for yourself. You don’t have to make all this money– I don’t feel like success is anything about that. Success is being true to yourself, having a great clientele, and being down to earth. Billy: We are looking to work with other salons and invite stylists to come experience our space. Our goal is to build a strong hair community to teach and learn from each other. Rachel: We also showcase artists, photography, painting, and jewelry in our space. Why not help others grow? We want to create a hub where someone can show their work and it also brings a greater experience to our clients. Modern and unique. We define ourselves through defining you. There is no staple- we customize our work to our guests. It’s handcrafted looks, everyone has their own twist. We love all the businesses in the surrounding area! We go to Basin for seafood and love Edgar Caro’s new Colombian steakhouse, Brasa on Metairie Road. The other store we go to a ton in this area is Funky Monkey. We do a lot of photoshoots and events, and can always find the perfect pieces. Before you start putting your business together– what to order, where to set up shop, how to decorate it– the first thing that will make you succeed with any business is having a clear purpose of existence. I’ve never had a business fail, and I had my first business at 12 years old. Set your purpose of existence and use your ethics to build around that idea. No matter the business if you stick to those two things, your purpose and your ethics, you will have success.